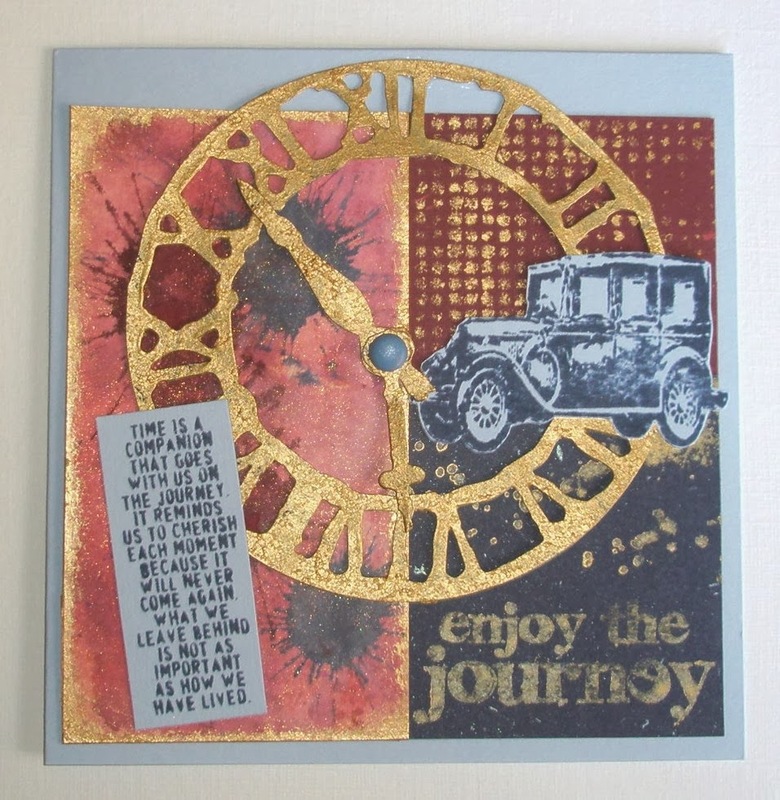 Thought I'd have a play this morning and make a card for the new Vintage Journey Challenge. It's a vintage, shabby Tim Holtz style challenge where the theme is Anything Tim - why don't you check out the link above and have a go....there are prizes too!! Its a patchwork of card with lots of layers and I've used Aged Mahogany and Chipped Sapphire Distress Inks and Stains, plus Gold Dabber paint for backgrounds and stamping. The stamps are all Tim Holtz from various sets and I've added gold through the Dot Fade stencil for added interest. I've die cut the clock face and hands, painted gold and fastened with a brad. I'm also going to enter this in the Country View Crafts challenge where the theme is PAPER. Well all this is card (thick paper!) apart from the brad so hope it qualifies! Well that's crafting done for the day - the sun is shining and the garden calls!! Love the patchwork background and the gilded clock looks fabulous! Thank you for joining us on A Vintage Journey. Your clock looks fabulous on the wonderful patchwork background. The stencilling is wonderful. Thank you for sharing your lovely card with us at Country View Challenges this month.